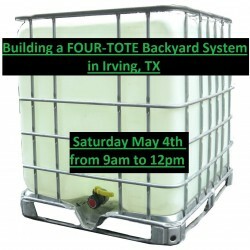 Come join Green Phoenix Farms for an On-Site Workshop to build a good sized “backyard” aquaponic system at a residential home in Irving, TX. This system is a custom design using four IBC totes. One tote will be used as the Fish Tank and a second will be the Sump tank. The remaining two totes will be sectioned into Grow-Beds. One very unique feature of this system will be the drainage system for the Grow-Beds. The beds will be run in pairs and drained through the use of a large auto-siphon plumbed outside of the growbeds. This external siphon, also known as a “Mega-Siphon” will be housed buy viagra online inurl:nc in a separate bucket and will drain one of the pairs of grow-beds. The manual for this system will include a design sketch of the overall system and a rough material list, along with a detailed description of the Mega-Siphon. You will be able to construct one of these on your own by the end of the workshop! The workshop will begin at 9:00am and run through 12:00pm. The cost for this class will be $30. Please remember that this will certainly be a hands-on workshop — be sure to wear clothes that are comfortable to be outdoors in and to work in. Extra drills will always be useful!